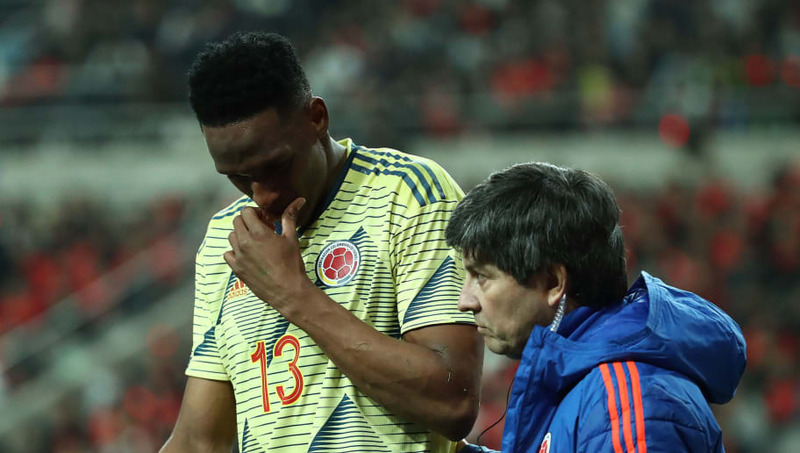 ​Everton manager Marco Silva is angry with the Colombia national team after Yerry Mina sustained a 'serious' injury whilst on international duty, despite the club urging them to not overly exert the defender. Mina has been restricted to just 15 outings across competitions since signing from ​Barcelona last summer, after starting the season with a foot injury and struggling to regain his form and fitness since. However, the ​Toffees were wary of his fitness following this sudden return to competitive action, and urged his country to not overuse him, advice which they did not heed. Mina played for the whole game against Japan before starting once more against South Korea, where he was forced to come off in the 43rd minute with a hamstring issue. And, as quoted by the ​Times, Silva was deeply frustrated by this turn of events, revealing: “It is not good news. It is serious. Bad news for us as a club and for him too. It has not been an easy season for him since he joined the club, he’s had some unlucky moments and some bad injuries.  "Messi is much more natural and he's consistent..."
“We knew before he went to the international team that it could have been a risk to play two matches. We communicated this to them but we cannot control their decisions. We advised them after he played 90 minutes against ​Chelsea that it was a risk to play him in two matches in a short period."